Huawei’s P30 and P30 Pro models have been hogging all the limelight since their unveiling last month in Paris. These phones cater to the premium segment, which means not everyone can afford to buy them, especially in emerging markets like China and India. The Chinese company has quietly launched Huawei P30 Lite in Canada, the Philippines and a few other countries to cater to the price-conscious consumers. Samsung has done something similar with the Galaxy S10E, which was launched as an affordable variant of the Galaxy S10 and S10 Plus flagship models. The S10E is still much more expensive than the P30 Lite, but Huawei’s phone is jam-packed with powerful hardware and a triple camera system. 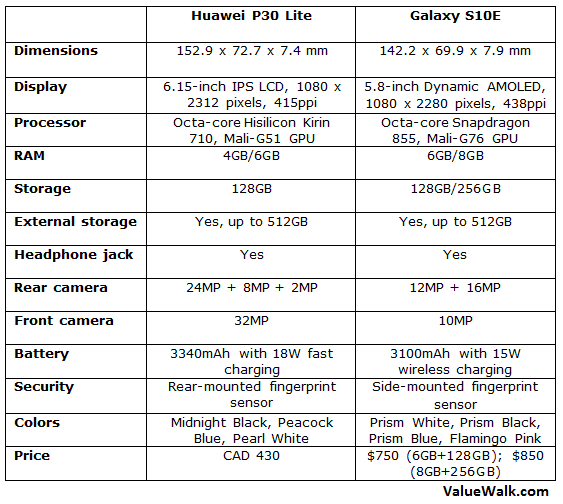 So, let’s dive into a detailed Huawei P30 Lite vs Galaxy S10E comparison to see whether Huawei’s new affordable phone offers better value for money than the S10E. The P30 Lite has a design similar to its more expensive siblings P30 and P30 Pro. It has a waterdrop notch to accommodate the front camera. Unlike its expensive siblings, the Lite version doesn’t get an in-display fingerprint sensor. The device features the fingerprint sensor on the back panel, which is not the most convenient way to unlock your device. It measures 152.9 x 72.7 x 7.4 mm and weighs 159g. The rear panel appears to be made out of plastic with gradient colors. It will be available in Midnight Black, Pearl White, and Peacock Blue colors. The Galaxy S10E has a nearly bezel-less Infinity-O display with a laser cut hole in the top right corner to accommodate the front camera. The rear panel is made out of the glass to facilitate wireless charging and the dual cameras are arranged horizontally. It measures 69.9 x 142.2 x 7.9mm and weighs 150g. Its all-glass body is supported by an aluminum frame in the middle. The S10E comes in Prism White, Prism Black, Prism Blue, and Flamingo Pink colors. For authentication and security, the S10E features a side-mounted fingerprint sensor, which is fast, secure, and reliable. The P30 Lite packs a 6.15-inch IPS LCD panel with Full HD+ resolution of 1080 x 2312 pixels. It lacks the AMOLED panel, which is expensive but offers more vibrant colors and better viewing experience. It has an 84.2% screen-to-body ratio and 415ppi of pixel density. The S10E, on the other hand, features an advanced Dynamic AMOLED display with 19:9 aspect ratio, 1080 x 2280 pixels resolution, and 438ppi of pixel density. The Always-on display offers HDR10+ support, and is protected by Corning’s Gorilla Glass 5. It has an 83.3% screen-to-body ratio. The display has a hole in the top right corner to accommodate the front camera. The P30 Lite is more modest than the S10E when it comes to internal specifications. The P30 Lite is powered by a mid-range octa-core Kirin 710 processor with Mali-G51 GPU. It comes in 4GB and 6GB RAM variants and 128GB of internal storage. The 6GB RAM variant is currently available only in the Philippines. The device supports external storage of up to 512GB via a microSD slot. Huawei’s device packs a decent 3,340mAh battery with 18W fast charging support via a USB Type-C port. It doesn’t support wireless charging. On the software front, it runs Huawei’s custom EMUI 9.0 skin on top of Android 9 Pie. In contrast, the Galaxy S10E packs an insanely powerful Qualcomm Snapdragon 855 processor with 6GB RAM and 128GB of internal storage. There is also an 8GB RAM variant with 256GB storage. The S10E also supports external memory of up to 512GB via a microSD card slot. The S10E packs a 3100mAh battery with 15W fast charging and fast wireless charging support. It also supports bidirectional wireless charging, allowing you to charge your accessories and other compatible devices by putting them on the back of S10E. It runs Samsung’s One UI skin on top of Android 9 Pie. The One UI skin displays navigation options near the bottom of the display to ensure they are within your thumb’s reach, while the content is displayed in the top half of the screen. Both Huawei and Samsung have proved their mettle in smartphone photography. Despite its affordable price tag, the P30 Lite gets a triple camera system on the back. It packs a 24MP primary lens with f/1.8 aperture, an 8MP ultra-wide sensor, and a 2MP depth sensor for bokeh effect. The camera supports Portrait mode, Night mode, Pro Mode, Time-lapse, and HDR photography. On the front, it gets a 32MP lens with f/2.0 aperture and HDR support. The Galaxy S10E features a dual camera setup on the back. It consists of a 12MP wide-angle lens with variable apertures of f/1.5 and f/2.4, and a 123-degree 16MP ultra-wide-angle lens with f/2.2 aperture. It supports 4K video recording and OIS. The apertures on the wide-angle lens switch automatically between the two depending on the lighting conditions to take the best shot. On the front, it features a 10MP lens with f/1.9 aperture, same as the more expensive Galaxy S10. Huawei is currently locked in a bitter dispute with the US government, so the P30 Lite is unlikely to launch in the US. However, it’s up for pre-order in Canada, the Philippines, and a few other markets. It’s priced at CAD 430 for the 4GB/128GB variant in Canada, which is equivalent to $320 in the US. Pre-order customers in Canada will get a free Band 3 Pro if they purchase the device from one of the partner retailers. The Galaxy S10E is more than twice as expensive as the P30 Lite. It has a superior AMOLED display and a much faster processor than P30 Lite. It starts at $750 for the 6GB/128GB model and goes up to $850 for the 8GB/256GB variant. 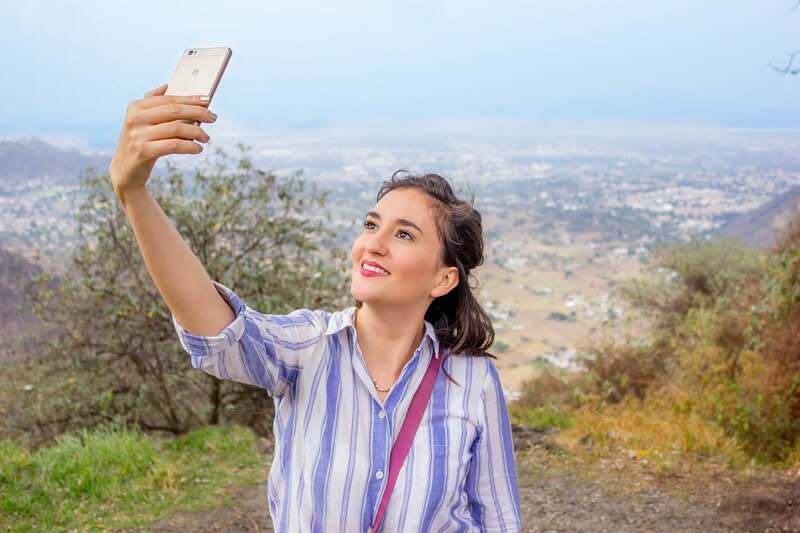 If you do not want to spend that much and you happen to live outside the United States, the P30 Lite offers excellent value for money.